Sir Kenneth Mathieson Dalglish MBE (born 4 March 1951) is a Scottish former football player and manager. He made over three hundred appearances for both Celtic and Liverpool and earned over one hundred caps for the Scotland national team. Dalglish won the Ballon d'Or Silver Award in 1983, the PFA Players' Player of the Year in 1983, and the FWA Footballer of the Year in 1979 and 1983. In 2009, FourFourTwo named Dalglish the greatest striker in post-war British football, and in 2006, he topped a Liverpool fans' poll of "100 Players Who Shook the Kop". He has been inducted into both the Scottish and English Football Halls of Fame. Dalglish began his career with Celtic in 1971, going on to win four Scottish league championships, four Scottish Cups and one Scottish League Cup with the club. In 1977, Liverpool manager Bob Paisley paid a British transfer record of £440,000 to bring Dalglish to Liverpool. His years at Liverpool were among the club's most successful periods, as he won six English league championships, the FA Cup, four League Cups, five FA Charity Shields, three European Cups and one European Super Cup. For these achievements and his style of play, he was given the nickname King Kenny by Liverpool supporters. In international football, Dalglish made 102 appearances and scored 30 goals for Scotland between 1971 and 1986, becoming their most capped player and joint-leading goalscorer (with Denis Law). Dalglish became player-manager of Liverpool in 1985 after the resignation of Joe Fagan, winning a further three First Divisions, a FA Cup, and four FA Charity Shields, before resigning in 1991. Eight months later, Dalglish made a return to football management with Blackburn Rovers, whom he led from the Second Division to win the Premier League in 1995. Soon afterwards, he stepped down as manager to become Director of Football at the club, before leaving altogether in 1996. In January 1997, Dalglish took over as manager at Newcastle United. Newcastle finished runners-up in both the Premier League and FA Cup during his first season, but they only finished 13th in 1997–98, which led to his dismissal the following season. Dalglish went on to be appointed Director of Football at Celtic in 1999, and later manager, where he won the Scottish League Cup before an acrimonious departure the following year. Between 2000 and 2010, Dalglish focused on charitable concerns, founding The Marina Dalglish Appeal with his wife to raise money for cancer care. In January 2011, Dalglish returned to Liverpool for a spell as caretaker manager after the dismissal of Roy Hodgson, becoming the permanent manager in May 2011. Despite winning the League Cup which earned them a place in the UEFA Europa League, and reaching the FA Cup Final, Liverpool only finished 8th in the Premier League, and Dalglish was dismissed in May 2012. In October 2013, Dalglish returned to Anfield as a non-executive director, and had Anfield's Centenary Stand renamed after him in May 2017. Dalglish, the son of an engineer, was born in Dalmarnock in the East End of Glasgow, and was brought up in Milton in the north of the city. He moved to the docklands of Govan, near Ibrox, home of Rangers, when he was 15, and he grew up supporting Rangers. Dalglish attended Miltonbank Primary School in Milton and started out as a goalkeeper. He then attended High Possil Senior Secondary School, where he won the inter-schools five-a-side and the inter-year five-a-side competitions. He won the Scottish Cup playing for Glasgow Schoolboys and Glasgow Schools, and was then selected for the Scottish schoolboys team that went undefeated in a home nations Victory Shield tournament. In 1966 Dalglish had unsuccessful trials at West Ham and Liverpool. Dalglish signed a provisional contract with Celtic in May 1967. The club's manager Jock Stein sent his assistant Sean Fallon to see Dalglish and his parents at their home, which had Rangers-related pictures on the walls. In his first season Dalglish was loaned out to Cumbernauld United, for whom he scored 37 goals. During this time he also worked as an apprentice joiner. Stein wanted Dalglish to spend a second season on loan at Cumbernauld, but the youngster wanted to turn professional. Dalglish got his wish, and became a regular member of the highly rated Celtic reserve team that became known as the Quality Street Gang, due to its having a large number of future Scottish internationals, including Danny McGrain, George Connelly, Lou Macari, and David Hay. Dalglish made his first-team competitive debut for Celtic in a Scottish League Cup quarter-final tie against Hamilton Academical on 25 September 1968, coming on as a second-half substitute in a 4–2 win. He played with the reserves throughout the 1968–69 season, but only scored four goals in 17 games. The following season, he moved into midfield, which saw his performances improve. Stein put Dalglish in the starting XI for the first team in a league match against Raith Rovers on 4 October 1969. Celtic won 7–1 but Dalglish didn't score, nor did he score in the next three first-team games he played in during season 1969–70. The reserves, however, benefited from his goalscoring talent from midfield as he helped them to the league and cup double, with him scoring 19 goals in 31 games. Dalglish continued his goalscoring form in the reserves into the next season, scoring 23 goals. A highlight of his season came in the Reserve Cup Final against Rangers. Dalglish scored one goal in a 4–1 win in the first leg, then in the second leg scored a hat-trick in a 6–1 win to clinch the cup. Still not a first-team regular, Dalglish was in the stands when the Ibrox disaster occurred at an Old Firm match in January 1971, when 66 Rangers fans died. On 17 May 1971, he played for Celtic against Kilmarnock in a testimonial match for the Rugby Park club's long serving midfielder, Frank Beattie. Dalglish scored six goals for Celtic in a 7–2 win. The 1971–72 season saw Dalglish finally establish himself in the Celtic first team, scoring 29 goals in 53 games and helping Celtic win their seventh consecutive league title. Dalglish also played in Celtic's 6–1 win over Hibernian in the 1972 Scottish Cup Final. In 1972–73 Dalglish was Celtic's leading scorer, with 39 goals in all competitions, and saw Celtic win yet another league championship. Celtic won a league and cup double in 1973–74 and reached the semi-finals of the European Cup. The ties against Atlético Madrid were acrimonious, and Dalglish described the first leg in Glasgow where the Spanish side had three players sent off as "without doubt the worst game I have ever played in as far as violence is concerned." Dalglish was made Celtic captain in the 1975–76 season, during which Celtic failed to win a trophy for the first time in 12 years. Stein had been badly injured in a car crash and missed most of that season while recovering from his injuries. Celtic won another league and cup double in 1976–77, with Dalglish scoring 27 goals in all competitions. On 10 August 1977, after making 320 appearances and scoring 167 goals for Celtic, Dalglish was signed by Liverpool manager Bob Paisley for a British transfer fee record of £440,000 (£2,685,000 today). The deal was unpopular with the Celtic fans, and Dalglish was booed by the crowd when he returned to Celtic Park in August 1978 to play in a testimonial match for Stein. Dalglish was signed to replace Kevin Keegan, and quickly settled into his new club. He made his debut on 13 August 1977 in the season opener at Wembley, in the 1977 FA Charity Shield against Manchester United. He scored his first goal for Liverpool in his league debut a week later on 20 August, against Middlesbrough. Dalglish also scored three days later on his Anfield debut in a 2–0 victory over Newcastle United, and he scored Liverpool's sixth goal when they beat Keegan's Hamburg 6–0 in the second leg of the 1977 European Super Cup. By the end of his first season with Liverpool, Dalglish had played 62 times and scored 31 goals, including the winning goal in the 1978 European Cup Final at Wembley against Bruges. In his second season Dalglish recorded a personal best of 21 league goals for the club, and he was also named Football Writers' Association Footballer of the Year. He did not miss a league game for Liverpool until the 1980–81 season, when he appeared in 34 out of 42 league games and scored only eight goals as Liverpool finished fifth in the league, but still won the European Cup and Football League Cup. He recovered his goal-scoring form the following season, and was an ever-present player in the league once again, scoring 13 goals as Liverpool became league champions for the 13th time, and the third time since Dalglish's arrival. It was also around this time that he began to form a potent strike partnership with Ian Rush; Dalglish began to play just off Rush, "running riot in the extra space afforded to him in the hole". Dalglish was voted PFA Players' Player of the Year for the 1982–83 season, during which he scored 18 league goals as Liverpool retained their title. From 1983 Dalglish became less prolific as a goalscorer, though he remained a regular player. After becoming player-manager on the retirement of Joe Fagan in the 1985 close season, Dalglish selected himself for just 21 First Division games in 1985–86 as Liverpool won the double, but he started the FA Cup final win over Everton. On the last day of the league season, his goal in a 1–0 away win over Chelsea gave Liverpool their 16th league title. Dalglish had a personally better campaign in the 1986–87 season, scoring six goals in 18 league appearances, but by then he was committed to giving younger players priority for a first-team place. With the sale of Ian Rush to Juventus in 1987, Dalglish formed a new striker partnership of new signings John Aldridge and Peter Beardsley for the 1987–88 season, and he played only twice in a league campaign which saw Liverpool gain their 17th title. Dalglish did not play in Liverpool's 1988–89 campaign, and he made his final league appearance on 5 May 1990 as a substitute against Derby. At 39, he was one of the oldest players ever to play for Liverpool. His final goal had come three years earlier, in a 3–0 home league win over Nottingham Forest on 18 April 1987. Tommy Docherty gave Dalglish his debut for the Scottish national side as a substitute in the 1–0 Euro 1972 qualifier victory over Belgium on 10 November 1971 at Pittodrie. Dalglish scored his first goal for Scotland a year later on 15 November 1972 in the 2–0 World Cup qualifier win over Denmark at Hampden Park. Scotland eventually qualified and he went to the 1974 World Cup in West Germany, where they were eliminated during the group stages despite not losing any of their three games. In 1976, Dalglish scored the winning goal for Scotland at Hampden Park against England, by nutmegging Ray Clemence. A year later Dalglish scored against the same opponents and goalkeeper at Wembley, in another 2–1 win. Dalglish went on to play in both the 1978 World Cup in Argentina – scoring against eventual runners-up the Netherlands in a famous 3–2 win – and the 1982 World Cup in Spain, scoring against New Zealand. On both occasions Scotland failed to get past the group stage. Dalglish was selected for the 22-man squad travelling to Mexico for the 1986 World Cup, but had to withdraw due to injury. In total, Dalglish played 102 times for Scotland (a national record) and he scored 30 goals (also a national record, which matched that set by Denis Law). His final appearance for Scotland, after 15 years as a full international, was on 12 November 1986 at Hampden Park in a Euro 1988 qualifying game against Luxembourg, which Scotland won 3–0. His 30th and final international goal had been two years earlier, on 14 November 1984, in a 3–1 win over Spain in a World Cup qualifier, also at Hampden Park. After the Heysel Stadium disaster in 1985 and Joe Fagan's subsequent resignation as manager, Dalglish became player-manager of Liverpool. In his first season in charge in 1985–86, he guided the club to its first "double". Liverpool achieved this by winning the League Championship by two points over Everton (Dalglish himself scored the winner in a 1–0 victory over Chelsea at Stamford Bridge to secure the title on the final day of the season), and the FA Cup by beating Everton in the final. The 1986–87 season was trophyless for Liverpool. They lost 2–1 to Arsenal in the League Cup final at Wembley. Before the 1987–88 season, Dalglish signed two new players: striker Peter Beardsley from Newcastle and winger John Barnes from Watford. He had already purchased goalscorer John Aldridge from Oxford United (a replacement for Ian Rush, who was moving to Italy) in the spring of 1987 and early into the new campaign, bought Oxford United midfielder Ray Houghton. The new-look Liverpool side shaped by Dalglish topped the league for almost the entire season, and had a run of 37 matches unbeaten in all competitions (including 29 in the league; 22 wins and 7 draws) from the beginning of the season to 21 February 1988, when they lost to Everton in the league. Liverpool were crowned champions with four games left to play, having suffered just two defeats from 40 games. However, Dalglish's side lost the 1988 FA Cup Final to underdogs Wimbledon. In the summer of 1988, Dalglish re-signed Ian Rush. Liverpool beat Everton 3–2 after extra time in the second all-Merseyside FA Cup final in 1989, but was deprived of a second Double in the final game of the season, when Arsenal secured a last-minute goal to take the title from Liverpool. In the 1989–90 season Liverpool won their third league title under Dalglish. They missed out on the Double and a third successive FA Cup final appearance when they lost 4–3 in extra-time to Crystal Palace in an FA Cup semi-final at Villa Park. At the end of the season Dalglish received his third Manager of the Year award. Dalglish resigned as manager of Liverpool on 22 February 1991, two days after a 4–4 draw with rivals Everton in an FA Cup fifth round tie at Goodison Park, in which Liverpool surrendered the lead four times. At the time of his resignation, the club were three points ahead in the league and still in contention for the FA Cup. Dalglish was the manager of Liverpool at the time of the Hillsborough disaster on 15 April 1989. The disaster claimed 94 lives on the day, with the final death toll reaching 96. Dalglish attended many funerals of the victims – including four in one day. – and his presence in the aftermath of the disaster has been described as "colossal and heroic". Dalglish broke a twenty-year silence about the disaster in March 2009, expressing regret that the police and the FA did not consider delaying the kick-off of the match. During the Hillsborough Memorial Service on 15 April 2011, Liverpool MP Steve Rotherham announced he would submit an Early Day Motion to have Dalglish knighted, "not only for his outstanding playing and managerial career, but also the charity work he has done with his wife, Marina, for breast cancer support and what he did after Hillsborough. It is common knowledge it affected him deeply". Dalglish returned to management in October 1991, at Second Division Blackburn Rovers. By the turn of 1992 they were top of the Second Division, and then suffered a dip in form before recovering to qualify for the playoffs, during which Dalglish led Blackburn into the new Premier League by beating Leicester City 1–0 in the Second Division Play-off final at Wembley. The resulting promotion meant that Blackburn were back in the top flight of English football for the first time since 1966. In the 1992 close season, Dalglish signed Southampton's Alan Shearer for a British record fee of £3.5 million. Despite a serious injury which ruled Shearer out for half the season, Dalglish achieved fourth position with the team in the first year of the new Premier League. The following year, Dalglish failed in an attempt to sign Roy Keane. Blackburn finished two positions higher the following season, as runners-up to Manchester United. By this time, Dalglish had added England internationals Tim Flowers and David Batty to his squad. At the start of the 1994–95 season Dalglish paid a record £5 million for Chris Sutton, with whom Shearer formed an effective strike partnership. By the last game of the season, both Blackburn and Manchester United were in contention for the title. Blackburn had to travel to Liverpool, and Manchester United faced West Ham United in London. Blackburn lost 2–1, but still won the title since United failed to win in London. The title meant that Dalglish was only the fourth football manager in history to lead two different clubs to top-flight league championships in England, after Tom Watson, Herbert Chapman and Brian Clough. Dalglish became Director of Football at Blackburn in June 1995. He left the club at the end of the 1995–96 season after a disappointing campaign under his replacement, Ray Harford. Following his departure from Blackburn Dalglish was appointed for a brief spell as an "international talent scout" at his boyhood club Rangers. He was reported as having played a central role in the signing of Chile international Sebastián Rozental. In January 1997, Dalglish was appointed manager of Premier League side Newcastle United on a three-and-a-half-year contract, taking over from Kevin Keegan. Dalglish guided the club from fourth position to a runner-up spot in May and a place in the new format of the following season's UEFA Champions League. He then broke up the team which had finished second two years running, selling popular players like Peter Beardsley, Lee Clark, Les Ferdinand and David Ginola and replacing them with ageing stars like John Barnes (34), Ian Rush (36) and Stuart Pearce (35), as well as virtual unknowns like Des Hamilton and Garry Brady. He also made some good long-term signings like Gary Speed and Shay Given. The 1997–98 campaign saw Newcastle finish in only 13th place and, despite Dalglish achieving some notable successes during the season (including a 3–2 UEFA Champions League win over Barcelona and an FA Cup final appearance against Arsenal), he was dismissed by Freddie Shepherd after two draws in the opening two games of the subsequent 1998–99 season, and replaced by former Chelsea manager Ruud Gullit. One commentator from The Independent has since written, "His 20 months at Newcastle United are the only part of Kenny Dalglish's career that came anywhere near failure". In June 1999 he was appointed director of football operations at Celtic, with his former Liverpool player John Barnes appointed as head coach. 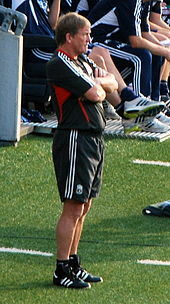 Barnes was dismissed in February 2000 and Dalglish took charge of the first team on an interim basis. He guided them to the Scottish League Cup final, where they beat Aberdeen 2–0 at Hampden Park. Dalglish was dismissed in June 2000, after the appointment of Martin O'Neill as manager. After a brief legal battle, Dalglish accepted a settlement of £600,000 from Celtic. In April 2009 Liverpool manager Rafael Benítez invited Dalglish to take up a role at the club's youth academy. The appointment was confirmed in July 2009, and Dalglish was also made the club's ambassador. Following Benítez's departure from Liverpool in June 2010, Dalglish was asked to help find a replacement, and in July Fulham's Roy Hodgson was appointed manager. A poor run of results at the start of the 2010–11 season led to Liverpool fans calling for Dalglish's return as manager as early as October 2010, and with no subsequent improvement in Liverpool's results up to the end of the year (during which time the club was bought by New England Sports Ventures), Hodgson left Liverpool and Dalglish was appointed caretaker manager on 8 January 2011. Dalglish's first game in charge was on 9 January 2011 at Old Trafford against Manchester United in the 3rd round of the FA Cup, which Liverpool lost 1–0. Dalglish's first league game in charge was against Blackpool on 12 January 2011; Liverpool lost 2–1. After the game, Dalglish admitted that Liverpool faced "a big challenge". Shortly after his appointment, Dalglish indicated he would like the job on a permanent basis if it was offered to him, and on 19 January the Liverpool chairman Tom Werner stated that the club's owners would favour this option. On 22 January 2011, Dalglish led Liverpool to their first win since his return, against Wolves at Molineux. After signing Andy Carroll from Newcastle for a British record transfer fee of £35 million and Luis Suárez from Ajax for £22.8 million at the end of January (in the wake of Fernando Torres's sale to Chelsea for £50 million), some journalists noted that Dalglish had begun to assert his authority at the club. Following a 1–0 victory against Chelsea at Stamford Bridge in February 2011, described by Alan Smith as "a quite brilliant display in terms of discipline and spirit" and a "defensive masterplan" by David Pleat, Henry Winter wrote, "it can only be a matter of time before he [Dalglish] is confirmed as long-term manager". On 12 May 2011, Liverpool announced that Dalglish had been given a three-year contract. His first official match in charge was 2–0 defeat to Harry Redknapp's Spurs at Anfield. Dalglish's second stint in charge at Anfield proved controversial at times. The Scot defended Luis Suárez in the wake of the striker's eight-match ban for racially abusing Manchester United defender Patrice Evra when the teams met in October 2011. After the Uruguayan's apparent refusal to shake Evra's hand in the return fixture in February 2012, an apology from both player and manager came only after the intervention of the owners. In February 2012, Dalglish led Liverpool to their first trophy in six years, with victory in the 2011–12 Football League Cup. In the same season he also led Liverpool to the 2012 FA Cup Final where they lost 2–1 to Chelsea. Despite the success in domestic cups, Liverpool finished eighth in the league, their worst showing in the league since 1994, failing to qualify for Europe's Champions League for a third straight season. Following the end of the season, Liverpool dismissed Dalglish on 16 May 2012. In October 2013, Dalglish returned to Liverpool as a non-executive director. On 13 October 2017, Anfield's Centenary Stand was officially renamed the Kenny Dalglish Stand in recognition of his unique contribution to the club. Dalglish has been married to Marina since 26 November 1974. The couple have four children, Kelly, Paul, Lynsey and Lauren. Kelly has worked as a football presenter for BBC Radio 5 Live and Sky Sports. Paul followed in his father's footsteps as a footballer, playing in the Premier League and Scottish Premiership before traveling to the United States to play for the Houston Dynamo in Major League Soccer. He retired in 2008 and became a coach, spending time as head coach of Ottawa Fury FC and Miami FC in the second-division leagues of North America. Dalglish's wife Marina was diagnosed with breast cancer in March 2003, but was treated at Aintree Hospital in Liverpool and recovered. She later launched a charity to fund new cancer treatment equipment for UK hospitals. Dalglish was appointed a Member of the Order of the British Empire (MBE) in the 1985 New Year Honours for services to football. He was appointed a Knight Bachelor in the 2018 Birthday Honours for services to football, charity and the City of Liverpool. In 2004, Dalglish and his wife founded the charity The Marina Dalglish Appeal to raise money to help treat cancer. Dalglish has participated in a number of events to raise money for the charity, including a replay of the 1986 FA Cup Final. In June 2007 a Centre for Oncology at Aintree University Hospital was opened, after the charity had raised £1.5 million. Dalglish often competes in the annual Gary Player Invitational Tournament, a charity golfing event which raises money for children's causes around the world. On 1 July 2011, Dalglish was awarded an honorary degree by the University of Ulster, for services to football and charity. ^ a b "Kenny Dalglish". Barry Hugman's Footballers. Retrieved 30 December 2018. ^ "Scotland U23 player Kenny Dalglish". FitbaStats. Retrieved 10 July 2018. ^ Carroll, James (24 January 2010). "Dalglish named the greatest". Liverpool F.C. Archived from the original on 4 March 2014. Retrieved 29 October 2017. ^ "100 PWSTK – THE DEFINITIVE LIST". Liverpool F.C. 8 October 2006. Archived from the original on 25 January 2011. Retrieved 1 January 2011. ^ Ingle, Sean (8 January 2011). "Liverpool let Roy Hodgson go – and appoint Kenny Dalglish as caretaker". The Guardian. London. Retrieved 9 February 2011. ^ Gibbs, Thom (26 February 2012). "Cardiff City v Liverpool: live". The Daily Telegraph. London. Retrieved 26 February 2012. ^ "Liverpool FC and Kenny Dalglish a story like no other…". Liverpool F.C. 3 May 2017. Retrieved 4 May 2017. ^ "A short history of the new Kenny Dalglish Stand". Liverpool F.C. 3 May 2017. Retrieved 4 May 2017. ^ "Liverpool manager Kenny Dalglish through the years: in pictures". The Daily Telegraph. London. ^ a b c d "In pictures: Kenny Dalglish returns to the Glasgow streets where he grew up to mark the publication of a new book celebrating his life". Daily Record. 22 September 2013. Retrieved 10 July 2018. ^ "Hall of Fame Kenny Dalglish". International Football Hall of Fame. Retrieved 11 October 2011. ^ a b c d e f g h i j k l m n "Player profile". lfchistory.net. Retrieved 14 August 2015. ^ "NOW YOU KNOW: Kenny Dalglish debuted for Celtic against Hamilton". Evening Times. 18 March 2009. Retrieved 18 June 2009. ^ "Games Involving Dalglish, Kenny in season 1969/1970". FitbaStats. Retrieved 23 February 2017. ^ "Kenny Dalglish: Hillsborough families are magnificent". Liverpool Echo. 15 April 2009. Retrieved 11 October 2011. ^ "Dalglish hits six in testimonial". The Glasgow Herald. 15 May 1971. Retrieved 28 January 2016. ^ a b "Dalglish, Kenny". FitbaStats. Retrieved 23 February 2017. ^ "Remembering Jock Stein". BBC Sport. 6 September 2005. Retrieved 18 June 2009. ^ a b "Benitez opens talks with Dalglish". BBC Sport. 24 April 2009. Retrieved 21 May 2009. ^ "Rush, Dalglish voted best British strike duo". The Independent. London. 6 March 1999. Retrieved 18 October 2011. ^ Benammar, Emily (27 April 2008). "PFA Player of the Year winners 1974–2007". The Daily Telegraph. London. Retrieved 18 June 2009. ^ a b "Chelsea 0–1 Liverpool, First Division, May 3, 1986". Daily Mirror. London. Retrieved 11 October 2011. ^ "Liverpool 1–0 Derby County". LFCHistory.net. Retrieved 3 February 2011. ^ "Liverweb all-time playing records". Liverweb. Retrieved 11 October 2011. ^ "Scotland 3–2 Holland, World Cup finals group stage, June 11, 1978". Daily Mirror. London. Retrieved 11 October 2011. ^ Grahame, Ewing (8 October 2008). "George Burley backs Darren Fletcher to beat Kenny Dalglish's Scotland cap record". The Daily Telegraph. Retrieved 18 June 2009. ^ "The Kenny Dalglish file". BBC Sport. 27 August 1998. Retrieved 18 June 2009. ^ "Scotland 3 Luxembourg 0". The Glasgow Herald. 13 November 1986. Retrieved 27 August 2013. ^ Bevan, Chris; Barder, Russell (23 January 2009). "When Dalglish did the Double". BBC Sport. Retrieved 18 June 2009. ^ Smith, Rory (17 April 2009). "Top 10 classic FA Cup semi-finals". The Daily Telegraph. London. ^ Birchall, Jon (14 January 2011). "Remembering 4–4 draw between Everton FC and Liverpool FC". Liverpool Echo. Retrieved 14 October 2011. ^ "The day from which Liverpool have never recovered". ESPN. Retrieved 9 February 2018. ^ Taylor, Louise (14 January 2011). "The game that forced Kenny Dalglish to resign as Liverpool manager". The Guardian. London. Retrieved 14 January 2011. ^ Winter, Henry (17 October 2011). "Hillsborough disaster: release of papers is long overdue". The Daily Telegraph. London. Retrieved 17 October 2011. ^ Herbert, Ian (17 May 2012). "King Kenny loses grip on poisoned chalice". The Independent. London. Retrieved 17 May 2012. ^ "Dalglish breaks disaster silence". BBC Sport. 3 March 2009. Retrieved 18 June 2009. ^ Stewart, Gary (27 April 2011). "Liverpool MP Steve Rotheram tables parliamentary motion to get Kenny Dalglish knighted". Liverpool Echo. Retrieved 11 October 2011. ^ Singleton, Ian (9 April 2012). "How Kenny Dalglish turned a six-game losing run into glory". BBC Sport. Retrieved 10 April 2012. ^ "Blackburn Rovers owner dies". BBC Sport. 18 August 2000. Retrieved 18 June 2009. ^ "The Kenny Dalglish story". The Guardian. 11 February 2000. ^ "Dual role for Dalglish Golf is part of the job at Ibrox". The Herald. Glasgow. ^ "KENNY'S BLUES MOVIE; Dalglish video sets up Seb deal". Sunday Mail. Glasgow. 17 November 1996 – via TheFreeLibrary.com. ^ Ryder, Lee. "Asprilla: How Dalglish destroyed The Entertainers". Chronicle Live. ^ "Sport: Football Gullit named Newcastle boss". BBC Sport. 27 August 1998. Retrieved 21 May 2009. ^ Rich, Tim (1 May 2011). "The chief problem for Dalglish on Tyneside was that he wasn't Keegan". The Independent. London. Retrieved 18 October 2011. ^ "Dalglish back at Parkhead". BBC Sport. 10 June 1999. Retrieved 21 May 2009. ^ "Barnes sacked as Dalglish holds the fort". The Guardian. 10 February 2000. Retrieved 28 February 2019. ^ Forsyth, Roddy (30 June 2000). "Dalglish hits out over messy Celtic divorce". The Daily Telegraph. London. Retrieved 28 February 2019. ^ "Dalglish wins £600,000 claim against Celtic". The Daily Telegraph. London. 15 December 2000. Retrieved 18 June 2009. ^ "Dalglish makes Liverpool return". BBC Sport. 4 July 2009. Retrieved 4 July 2009. ^ "Roy Hodgson leaves Fulham to become Liverpool manager". BBC Sport. 1 July 2010. Retrieved 13 October 2015. ^ Hunter, Andy (4 October 2010). "Spectre of Kenny Dalglish hovers over Roy Hodgson at Liverpool". The Guardian. London. Retrieved 5 October 2010. ^ "Liverpool takeover completed by US company NESV". BBC Sport. ^ "Roy Hodgson exits Liverpool & Kenny Dalglish takes over". BBC Sport. 8 January 2011. Retrieved 8 January 2011. ^ "Man Utd 1–0 Liverpool". BBC Sport. 9 January 2011. Retrieved 10 January 2011. ^ Winter, Henry (12 January 2011). "Blackpool 2 Liverpool 1: match report". The Daily Telegraph. London. Retrieved 13 January 2011. ^ Hunter, Andy (13 January 2011). "Liverpool face 'big challenge' after Blackpool defeat, says Kenny Dalglish". The Guardian. London. Retrieved 13 January 2011. ^ Winter, Henry (10 January 2011). "Kenny Dalglish admits he would be 'delighted' to become the permanent Liverpool manager". The Daily Telegraph. London. Retrieved 11 January 2011. ^ Smith, Rory (20 January 2011). "Liverpool hope to compromise with Ajax over Luis Suárez". The Daily Telegraph. London. Retrieved 20 January 2011. ^ White, Duncan (22 January 2011). "Wolverhampton Wanderers 0 Liverpool 3: match report". The Daily Telegraph. London. Retrieved 3 February 2011. ^ Hunter, Andy (2 February 2011). "Kenny Dalglish moves towards permanent manager's role at Liverpool". The Guardian. London. Retrieved 3 February 2011. ^ Winter, Henry (1 February 2011). "Kenny Dalglish loses Fernando Torres but finds crown princes in Andy Carroll and Luis Suárez". The Daily Telegraph. London. Retrieved 3 February 2011. ^ Smith, Alan (7 February 2011). "Fernando Torres's substitution the ultimate accolade to stubborn Liverpool at Stamford Bridge". The Daily Telegraph. London. Retrieved 7 February 2011. ^ Pleat, David (6 February 2011). "Chelsea big hitters stifled by Kenny Dalglish's defensive masterplan". The Guardian. London. Retrieved 7 February 2011. ^ Winter, Henry (6 February 2011). "Chelsea 0 Liverpool 1: match report". The Daily Telegraph. London. Retrieved 7 February 2011. ^ "Kenny signs three-year deal". Liverpool F.C. 12 May 2011. Archived from the original on 14 May 2011. Retrieved 12 May 2011. ^ Roan, Dan (13 February 2012). "Handshake: Suarez and Dalglish apologise after owners intervene". BBC Sport. Retrieved 4 October 2018. ^ a b "Kenny Dalglish sacked over Luis Suarez row – Sir Alex Ferguson". BBC Sport. 20 July 2012. Retrieved 4 October 2018. ^ "Cardiff City 2 Liverpool 2; Liverpool win on penalties". The Daily Telegraph. London. 27 February 2012. Retrieved 27 February 2012. ^ Panja, Tariq (17 May 2012). "Liverpool Fires Dalglish After Worst League Finish in 18 Years". Bloomberg. Archived from the original on 20 June 2012. Retrieved 19 May 2012. ^ "Kenny Dalglish sacked as Liverpool manager". BBC Sport. 16 May 2012. Retrieved 29 March 2017. ^ "Kenny Dalglish returns to Liverpool on board of directors". BBC Sport. 4 October 2013. Retrieved 29 March 2017. ^ "Liverpool FC officially unveil the Kenny Dalglish Stand". Liverpool F.C. 13 October 2017. ^ "Lauren Dalglish congratulates parents on 40th wedding anniversary". Twitter. 26 November 2014. Retrieved 26 November 2014. ^ Winter, Henry (23 December 2017). "Kelly Cates interview: I've felt Hillsborough pain differently since becoming a mother". The Times. Retrieved 11 March 2018. ^ Kaufman, Michelle (25 January 2018). "Miami FC has a new coach. It's a name soccer fans will recognize". Miami Herald. Retrieved 26 January 2019. ^ "Dalglish's wife tells of her cancer fight". The Scotsman. 25 December 2003. Retrieved 26 January 2019. ^ Taylor, Joshua (28 May 2016). "Kenny and Marina Dalglish unveil new breast cancer scanner at Aintree Hospital". Liverpool Echo. Retrieved 26 January 2019. ^ a b "No. 49969". The London Gazette (Supplement). 31 December 1984. p. 13. ^ a b "No. 62310". The London Gazette (Supplement). 9 June 2018. p. B2. ^ Rogers, Paul (1 May 2006). "Reds leave it late to win Replay 86". Liverpool F.C. Archived from the original on 26 October 2014. Retrieved 20 October 2011. ^ "The Marina Dalglish Appeal – About Us". The Marina Dalglish Appeal.org. Retrieved 20 October 2011. ^ "Gary Player Invitational Returns to Wentworth". Gary Player.com. 27 April 2006. Retrieved 18 June 2009. ^ Sutton, John (2 July 2011). "Liverpool FC manager Kenny Dalglish awarded honorary degree". Liverpool Echo. Retrieved 11 October 2011. ^ "Dalglish, Kenny". FitbaStats. Retrieved 14 August 2015. ^ Strack-Zimmermann, Benjamin. "Kenny Dalglish". national-football-teams.com. ^ a b c d "Managers: Kenny Dalglish". Soccerbase. Centurycomm. Retrieved 29 March 2017. ^ a b c d e Philip, Robert (2011). "12. Kenny Dalglish MBE". Scottish Sporting Legends. Mainstream Publishing Company (Edinburgh) Ltd. ISBN 9781780571669. Retrieved 25 August 2014. ^ "Match details from Liverpool – Manchester United played on 13 August 1977 – LFChistory". ^ "Match details from Liverpool – Arsenal played on 11 August 1979 – LFC history". ^ "Charity Shield returns to Anfield". Liverpool F.C. ^ "1982/83 Charity Shield Liverpool v Tottenham Hotspur". ^ a b "Match details from Liverpool – Everton played on 16 August 1986". ^ "Ballon d'Or Winners". About.com. Retrieved 23 July 2015. ^ "England Player Honours – Professional Footballers' Association Players' Players of the Year". England Football Online. 19 June 2007. Retrieved 23 July 2015. ^ "FWA FOOTBALLER OF THE YEAR AWARD". footballwriters. Retrieved 23 July 2015. ^ a b "Kenny Dalglish". nationalfootballmuseum.com. Archived from the original on 28 March 2015. Retrieved 23 July 2015. ^ "Inductees 2004". scottishfootballhalloffame.co.uk. Retrieved 23 July 2015. ^ Davies, Christopher (5 March 2004). "Pele open to ridicule over top hundred". The Daily Telegraph. Retrieved 11 March 2018. ^ "Match details from Liverpool – Wimbledon played on 20 August 1988 – LFC history". ^ "Match details from Liverpool – Arsenal played on 12 August 1989 – LFC history". ^ "Match details from Liverpool – Manchester United played on 18 August 1990 – LFC history". ^ a b c "Manager profile: Kenny Dalglish". Premier League. Retrieved 14 September 2018. ^ "FWA TRIBUTE AWARD". Retrieved 23 July 2015. Kelly, Stephen (1993). Dalglish. Headline Book Publishing; New edition (19 August 1993). ISBN 0-7472-4124-4. Dalglish, Kenny; Winter, Henry (2010). My Liverpool Home. Hodder & Stoughton. ISBN 978-1-4447-0419-8. Macpherson, Archie (2007). Jock Stein: The Definitive Biography. Highdown; New Ed edition (18 May 2007). ISBN 1-905156-37-5. Wikimedia Commons has media related to Kenny Dalglish.